Crispy Chicken get’s eaten in our house more regularly than anything else because it is a child friendly quick tea. I would feel bad about that if I bought it from the supermarket ready done. I don’t feel so guilty about this homemade version though because it’s low-fat and I can choose the quality of chicken that I use. I haven’t posted it before because I can’t ever seem to photograph it before it get’s eaten! This is a quick snap I managed to get before it was all wrapped in soft tortillas with avocado, salad, chilli sauce and mayo. It’s also good as a snack or starter with chilli dipping sauce and works well cold in a sandwich the next day. It’s based on an Annabel Karmel recipe from when George was a fussy toddler, but it is a surprisingly tasty way to eat chicken and it makes it stretch much further too. 2 chicken breasts are plenty for the 3 of us. 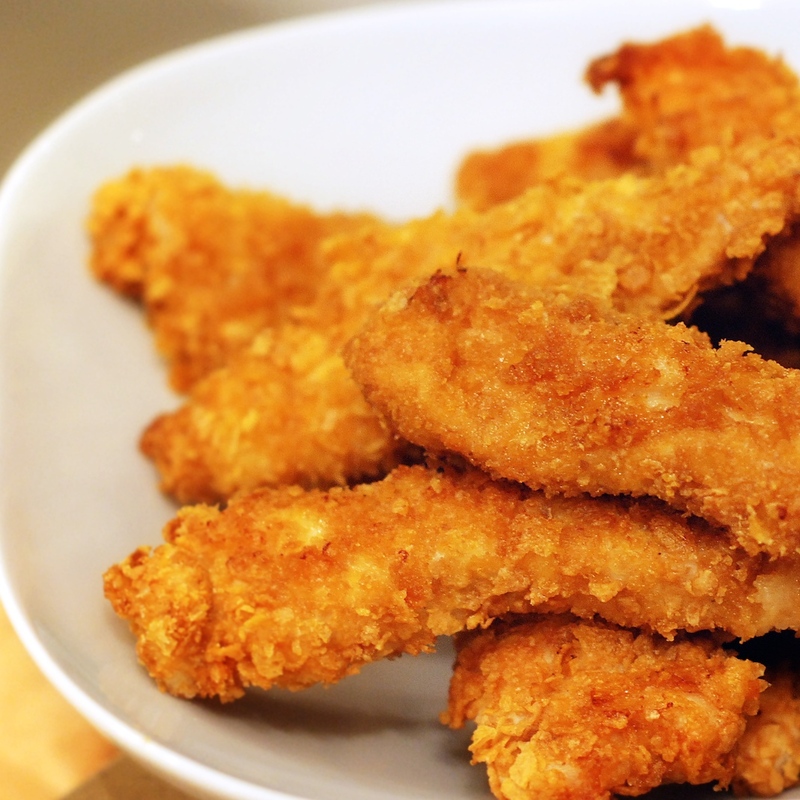 Cut the Chicken breasts into strips so they are no thicker than 3cm wide and 1-2cm thick. Dip them in the flour, then in the egg, then in the cornflakes. The cornflakes can be crushed in a bag with a rolling-pin, or as we eat this often I whizz up a whole box of cornflakes in the food processor and keep it in a Tupperware for when we need it. Lay them on a baking tray, it’s best if you line it with non stick foil, but not essential. Melt the butter in the microwave for 20 seconds, or in a hot pan and then drizzle a little bit over each strip. Don’t miss this step out, it makes a difference. Bake in the oven for 20 minutes at 200 degrees, turning half way through. They are done when they are just starting to bronze on the edges. This is the 3rd of a series of mini, single photo posts about food that we eat regularly. The best way to transform unhealthy food in healthy food. Well done! These really look like deep-fried chicken tenders… so crispy and gorgeously golden brown. I’m all for healthy versions of classic favorites! My mother has been making this Southern classic for years, but hers never looked like this! The cornflakes, while crisp on top, were woefully mushy in other places. Reading your instructions, it doesn’t look like you have a secret technique, but you’ve inspired me to try this again sometime soon! Just made this tonight for dinner after finding the recipe through tastespotting. It came out perfectly and the family loved it. Plus, it was really simple to make! The only addition I would make is maybe put some garlic powder in with the flour mixture. Thanks for the sharing this though!! Hi Jessica, yes I often mix garlic powder into my seasoned flour (except once when my hand slipped and it ended up with far too much in!) Glad you liked it! Thanks for visiting the blog.